Nichole and I met just after we graduated high school, during the summer before our freshman year of college. Due to a shared sense of quirkiness and a fond appreciation for random dance parties, we immediately became best friends. So when Nichole told me she was engaged, I was positively thrilled. Soon after, we began looking for bridesmaid dresses. She wanted navy dresses that were simple and elegant, but also long and affordable. The length was especially important because her ring ceremony was going to be outside in November. After scouring the internet, we couldn’t find anything that met all her requirements. Because she only had two bridesmaids, I felt confident in offering to make the dresses myself. We ended up spending just over $25 a dress. My favorite part is that they were long enough that I was able to wear fleece-lined leggings during the outdoor ceremony. 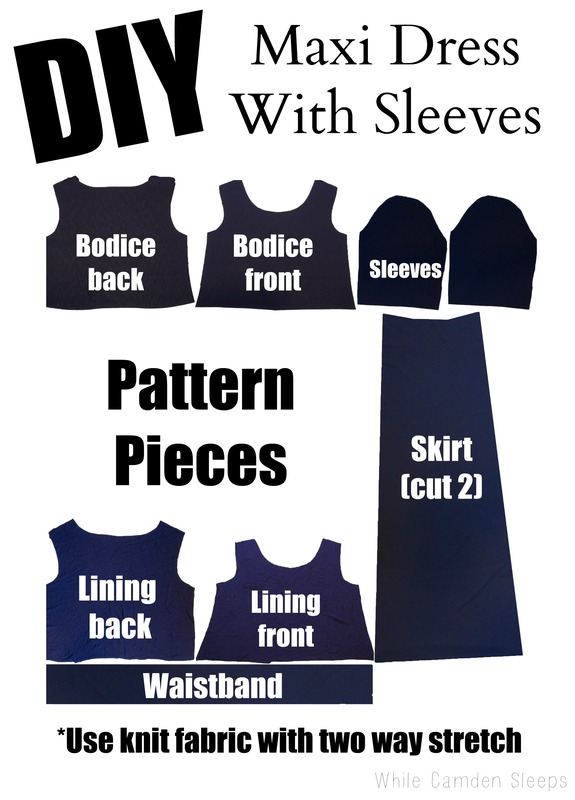 I made up the pattern using some sleeve and bodice pieces from other patterns as guides. Here are the final pieces I used for this DIY maxi dress. I used knit fabric that Nichole and I picked out together. We liked that it has a sheen to it that made it feel more formal than the average knit. It was a little sheer, so I lined the bodice with another navy knit to ensure no peek-a-boo affect in the pictures. Using a lining also helps with making a smooth neckline. See how I did it below. Click “NEXT” for the sewing steps. Beautiful job Kara!!! You make this look SEW easy!! You both are rockin’ those dresses too!!! TFS, I might take a stab, we’ll see. I see what you did there!!! So punny! Thanks for your kind words! I love you tutorial! I’m needing to make a similar dress for my sister’s wedding. I was wondering if you could share your measurements for each piece? I don’t have a dress at home to go off of. Thanks! I love your pattern!!! I’m 5’9 and about 135-140 pounds. The skirt length is 43 inches long. The waistband piece is 5 inches (with seam allowance). and the bodice is 18 inches (with seam allowance) from shoulder to waistband. The skirt is 29 inches (seam allowance) around on the top and then 46 on the bottom, though I would make it wider if you have enough fabric. How many yards of fabric did you use? I don’t quite remember. I want to say 3. I just used some knit cotton fabric I had on hand. I only lined the bodice.